A Podcast interview with Laurie Johnson. KUHF-Houston Public Radio News. ARTFORUM, "Big But Not Easy" Rachel Churner on "Prospect1 New Orleans"
Sculpture Magazine, "Prospect.1 New Orleans"
By Ernest Beck a New York-based freelance writer and editor. 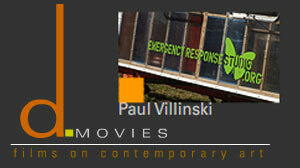 "Some Responses to Emergency Respose Studio"
A New York Times article, In Katrina's Wake, A New Biennial, features an image of the Emergency Response Studio. "Outdoor Installation by Paul Villinski Makes Its Debut at Wesleyan University's Zilkha Gallery"
"Character assassination masquerading as a review"